I was wondering if it could possibly still be transcribed?? I would be eternally grateful!! Thank you so much for your time!! This can happen, but not in that case. If you have a look on page 42, in my post of Sun Jul 29, 2012, 6:53 am, you'll see that I did it. I see you changed your post when quoting it , what you say here for the font is not what you asked a that time, so I did what you asked first. In the end, I'll probably just end doing a document myself. I'm already almost done with the document on my French Tehtar mode... but I'll all start again to have one whole new French mode following the English mode of the new publication. That is what happens with Tolkien's work : there is a risk of having to start everything again everytime they publish something. svp : ok, I note that. 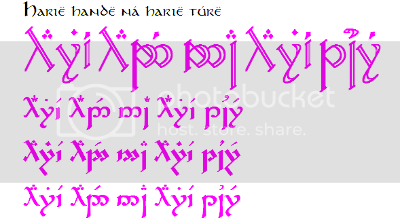 I had posted to the translation thread before I posted here and I think the language is elvish Sindarin. I asked for the translation of some word that is similar to passion, desire or lust and Xandarien answer to me the words Mael and Hûr. 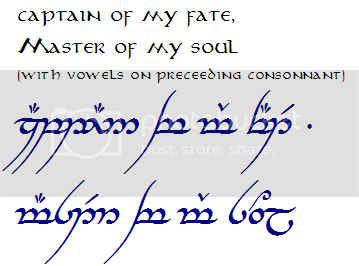 Can I have the English word "Soulmates" translated into “Tengwar Annatar" in regular? Please and thank you. This would be great ! And you are forgiven You are not the first to miss her answer ! As I said, at least you are here ! 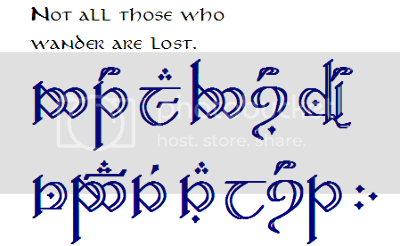 Eatenflesh, then it's indeed Sindarin. No problem. Good news everyone ! My schedule is coming back to "normal", so this morning, for the first time in months, I had a little time before going to work and I did a fiew transcriptions (lastly I had only 1 weekend on 2, so I was a bit drown in transcriptions at that time !). If I can do that a few times a week, the waiting delay will go back to the more acceptable delays I had before. Let's hope that it will ! I'll try to post the new transcriptions I did today. For dennyseccon : Here is the result according to a Portuguese mode proposed by fans (nice mode, reliable, respectful of Tolkien’s material). For svpsvp : OK… so I did it the way you wanted (if I got it well !) 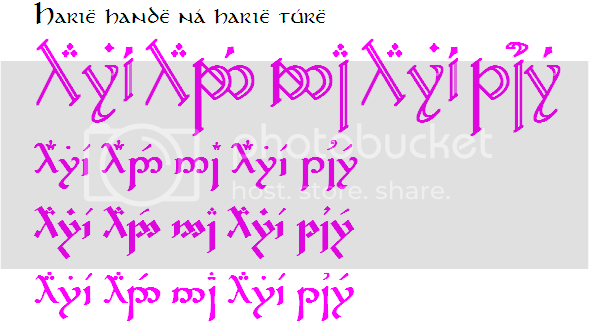 : placing the vowels as we do it for Quenya, but of course using the symbols for English. And you’ll understand that I won’t use long carriers if they are not appropriated. Long carriers have a meaning in an orthographical mode : long vowels (“é” or “ee”, for example). If you decide to modify it so that it correspond to your aesthetical purposes, go ahead, but I can’t do that. I accepted to change the vowel’s place because it’s not wrong to do so, even if it’s not the most logical way to write English. 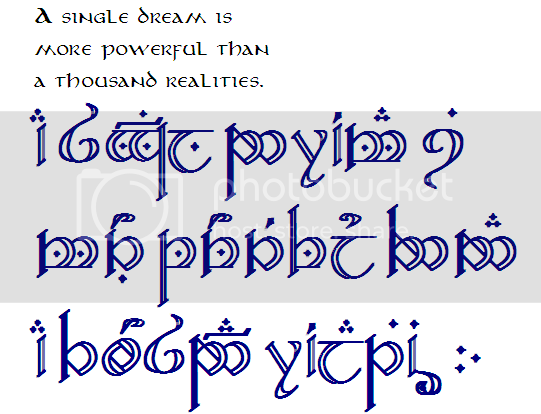 I made the number according to the elvish usage, so “31” (backward when compare to our usage), and below you have it in duodecimal system, so “fully” elvish, in case you would like it more that way (it says “11”). For Herumor Ragnir : Here you go, I hope you’ll like it ! and that is it for today ! Can I have the word "Joni" and "Fernando" translated into Tengwar (going to take a tattoo)? Thanks very much! In what language do you want me to consider them ? English ? Spanish ? other ? And do you have some precise fonts to ask ? Please read the first post of this thread to understand why I need to know these details. Ok sorry my bad. So Joni in finnish and Fernando in spanish. And fonts “TA-I, TA-R and TS-R+B”. 4. I tried to do it myself. 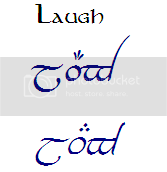 This is the result http://oi46.tinypic.com/2ujkves.jpg . I think the third one is the correct one. GORGEOUS! Thank you so much, I'll be sure to email you a pic once I get my tattoo! Thanks many thanks, apparently you speak spanish right? awesome. svpsvp wrote: Thanks many thanks, apparently you speak spanish right? awesome. Yes my third language, and favourite between the 3. Jes, I'm happy you like it that much I'll wait for the pic ! Isildilmë wrote: As you are here (and that is a great coincidence), I would also like to have a little help from you if that is possible, but that as no link with Tengwar or that thread. I have a personnal project involving Bulgaria. I don't know if it's going to happen, but if it gets concrete (probably next spring), then I'll have about 1 year to learn as much as Bulgarian as possible. Being a Bulgarian yourself, do you have any suggestion of references ? I know we can find many stuff on the net, but a lot of wrong information too. There are some apps for Apple available, but I hate to pay for stuff when I don't know if it's good. I already had a look on cyrillic tables, and some show contradictory informations, but I think I have something not so bad to start. By now that's all I have. I don't want to start learning it before the project is confirmed because that would make me even more deceived (learning the language will only get me more excited), but I'd like to be ready if it arrives so that I can learn quickly. Any hint from you or your friends is welcome. My native language is French, if that is of any help, and I speak English and Spanish already (not that fluently, but not that bad too I think !). 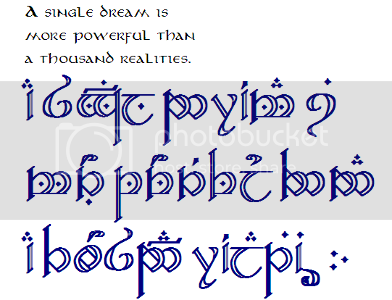 But as this has nothing to do with the thread, I suggest that we discuss it by email (isildilme@hotmail.com), keeping the thread for Tengwar/Elvish/Tolkien subjects ! So if you have some suggestions for me... ! Eatenflesh, don't worry. I'll do it for sure in these delays, unless I get hit by a bus or something. Isildilmë wrote: So if you have some suggestions for me... ! I will be glad to help you with anything! I wasn't sure about my transcriptions because I used a method for russian. And I wanted to add that I want the transcription from the cyrillic name. Hope that won't be a problem. Have a nice day! Yé ! A help from a native... what can I ask more ! As I said, for Bulgarian we can discuss by emails or Facebook. And the transcription will of course be based on the cyrillic. I created my mode with it. If you had not told me the cyrillic version, I would have asked for it. Thank you so much Isildme, it looks lovely! . I know that you're very busy, but I was hoping that I could also get it in TA(I)? I want to explore all options before I get the tattoo. I understand that you have lots of requests, so I'll be patient. And Thanks again! Herumor Ragnir wrote: Thank you so much Isildme, it looks lovely! . I know that you're very busy, but I was hoping that I could also get it in TA(I)? I want to explore all options before I get the tattoo. I understand that you have lots of requests, so I'll be patient. And Thanks again! For architect : Let’s hope your mother (and you) will like it ! I was wondering if it is still possible for you to transcribe it for me!! Also I was looking around for a proper transcription, again in TA-I, for the WORDS (not characters such as 9, 10, 11) but words, NINE, TEN, ELEVEN. I was hoping to get a tattoo of the phrase "Free Yourself", and I was wondering if you could help me? What is happening with people !?! The last post you wrote (before that one) was on October 3rd, and you said the same thing, that you had been forgotten or something, and that you asked it a month before. Isildilmë wrote: Caitlyn7679, I’m done with your transcription, and I posted it a little while ago ! On September 23 to be very precise (I think it’s about in the middle of page #54). I know I will look upset saying that, but it's not the case, I'm just a bit deceived of the quantity of people who seem to just ask, and not to read the answer. You didn't see the transcriptions, you asked for it as if I didn't do it, I told you very precisely where it was and you didn't read that answer neither. Hopefully not everybody does the same, because I would need to spend even more time on these explanations that could be saved with a little effort from everybody than on transcriptions themselves. I'm not sure I would continue ! Sorry this falls on you. I had to much of these lately (here or directly by email). The double shot just made it worst ! If you still want the numbers (in words), I can had you to my list, and it's a pleasure, but you wont have it until a few days or weeks, and I would expect from you to keep watching the thread from time to time and reading all the posts (at least those by me) to be sure that you don't miss my answer again. Thank you for your understanding.